We're still in the process of moving and the house is a complete mess . . . a beautiful mess though because I'm so happy to be in a house that I love with a glorious backyard. William has already spent a lot of time out there and came inside yesterday asking me to peel an orange he had picked off the tree. Heaven. Here's a project I've been wanting to share and now I can because it's finally done and displayed. I saw some really cute felt alphabet magnets a while ago but couldn't justify buying them so I decided to make my own using felt, batting and mighty magnets. Mine aren't quite as cute because the stitching is subpar and I just used the felt I had leftover in my fabric closet so the colors aren't as fun as the one I saw. However, it was "free" since I used things I already had and it was a great activity to do while I watch Lark Rise to Candleford compulsively. It is my new favorite BBC series. You should watch it. If you want to make your own here's how I did it: Print out the alphabet in a Word document using a font you like (I used Chunk Five). 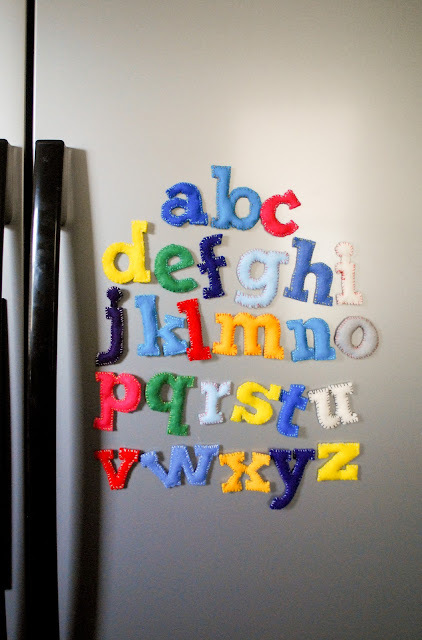 Then, using sharp scissors and/or a utility knife, cut out the letters. Pin the cut-outs on two small pieces of felt (mine are about 3 inches tall) and cut out. Using embroidering thread whip stitch the pieces together (here's a great tutorial if you don't know how to do that). Add batting and a magnet and finish stitching closed. That's it! Love the letters! The Chicken Thai wraps sound delicious. Thanks for sharing! Oh my I love them! I definitely want to make batch myself! So cute! And I LOVE Lark Rise to Candleford! It's definitely my favorite. next up you should try to get your hands on Downton Abbey, it's a series here and has the dad from Lark Rise in it too.